The debate continues on the current state of Music Education and most importantly, its future. This year’s theme is Youth Voice as we invite both children and young people, as well as their parents, to inform the national debate. 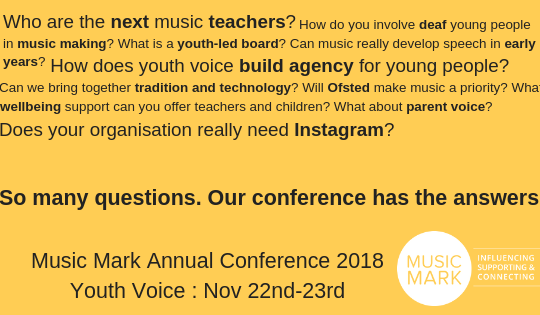 View description of workshops and the line-up of speakers, contributors and session leaders for the Music Mark Annual Conference 2018. Two days of learning, debate and networking with professionals from the Music Education sector. This year's theme is Youth Voice.